The entry level luxury saloon market is catching pace in almost every part of the world. Big brands are spending big on developing new volume generating entry level saloons. Mercedes Benz back in 2012’s Beijing motor show launched its “Concept Style Coupe” which immediately became the buzz around. Mercedes named it as the Mercedes CLA whereas other looked it as baby CLS. The car has been spied number of times and we at Carblogindia have reported it timely. 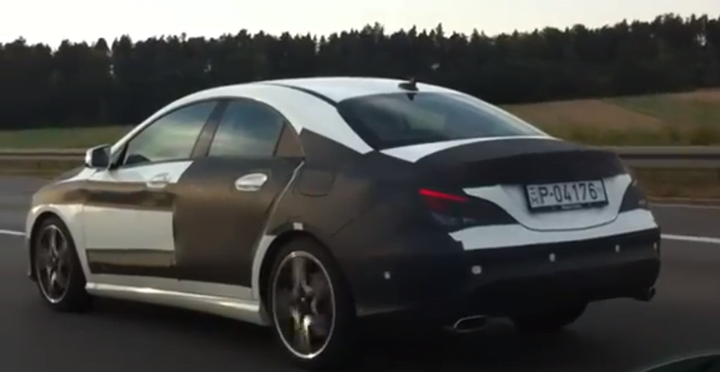 The Mercedes CLA has been spied again and this time with even less camouflage. The new Mercedes CLA will be placed below C class and looking at the pictures the car looks inspired from the concept shown by the Mercedes. The designers at Mercedes has made a beautiful machine here, the car’s front end is very ravishing and looks very elegant and upmarket whereas the side profile gives it a character of CLS. The cut and curves on the body gives the CLA a massive appeal. The car seems to be in its final stages and the spy picture indicates on it being a CLA45 AMG or CLA250 sports. The car is based on Mercedes MFA Mercedes Front wheel Architecture) on which the current A class and B class are based. Mercedes seems to use its MFA platform quite prominently as a SUV will be based on the same platform too. To power the car Mercedes will use the similar A class line up that is a 1.8 L 4 cylinder engine producing 211 BHP with 7 speed dual clutch and may company the AMG version too. We expect the car to reveal in the upcoming Paris Motor Show and will reach the showrooms by 2013. India launch is also expected but nothing official has been confirmed by the Mercedes India. Stay connected for more updates.